Its been a very busy week or so since our last post. just in time to save us a detour. Here is a link to an article about the fire we were headed towards. As we headed south the smoke increased as the visibility decreased. ground just the day before. The town had no water, or electricity. You can see downed electrical lines in the photo below. As we got south of town, we emerged from this smokey hell into a clear blue day. Our destination was the KOA in Ellensburg Washington where we stayed for 4 days. the Montana into the DH. The Monty is now residing at their Mountain Retreat. two young daughters, Francesca and Isabella arrived, rented and RV and met us at the KOA. a nice RV campground on the Columbia River in Washington. that supply power to the Northwest. A view of one of the spans of the dam discharging. Blackberry Bushes that were loaded with delicious fruit. Blackberries are covered with thousands of very sharp thorns. So I ran thru the bushes to keep my balance. The end result was my legs getting torn up quite nicely. and Hydrogen Peroxide can't handle however. little Isabella was like the Paparazzi and taking a bunch of photos. 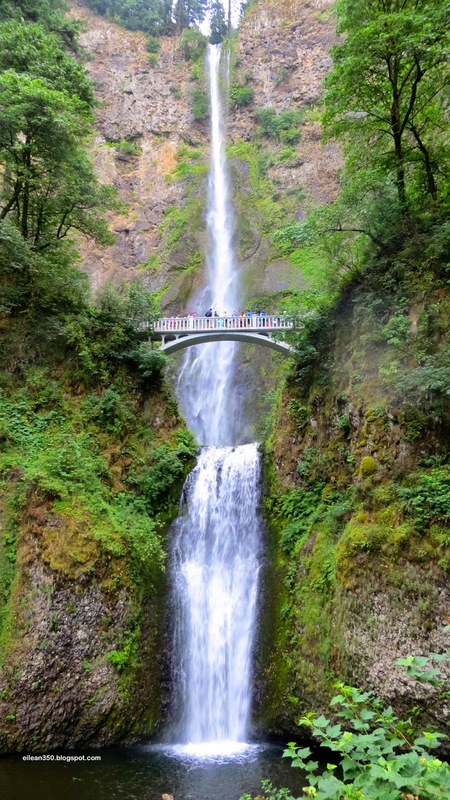 We then went to Multnomah Falls, with a 620' drop. Later we all had dinner. Michaela made a Bolonaise with Spaghetti. After two days at Timberlake we packed up and headed south to Sisters, Oregon. The highway rides up over the shoulder of Mt. Hood. Our Campsite in Sisters is the Creekside Park owned by the city. It is right in town and very convenient. We are the far camper, then Marcel, then Ron on the right. Kate as she circulated in the gift shops. that runs thru the campground. The water was cool, clear, and refreshing. Isabella strikes a pose for Kate. Tomorrow we will do some more exploring of the Bend, Oregon area. Bend is a beautiful progressive city with a wonderful dry climate. resource for the residents. It should make for some fun people watching tomorrow. visit 3 more stops along the way. 250+ miles down the road in Quesnel, BC. The smoke from nearby forest fires created a colorful sunset. Roberts was nothing to write home about, but a place to spend the night. And night is the correct word.... we now had darkness at night for sure. John & Dave were parked next door and Ron was down the block. and spent the night on the Thompson River at Juniper Beach Provincial Park. the shore of the Thompson. The water was quite cool but very refreshing in the 90 degree heat. Fortunately this provincial park had 30amp hookups. A rock jetty created a calm spot in the rushing river. Behind our campsites was a desert Oasis. towards Seattle and we headed East and South towards central Washington. We had a final cocktail hour with the whole group. taken over the last 2 months. and lamented how fast it has all passed. just transitioned to something new..
And we are now transitioning to a new path. and crossed back into the US at Oroville, Washington. who's name I cannot spell or pronounce. It is very hot and our ac works overtime on the 30amp connections. just flows by taunting me. So we are now transitioning from our Alaskan Odyssey to our new US journeys. some of the sights of the Great Pacific Northwest. narrative with the care and thought that it deserves. It was an amazing time shared with some fine people. armed with the knowledge that I gained on this trip. Thanks for riding along and sharing it with us. Tell the Yukon that we'll be back! at Meziadin Lake Provincial Park in BC. the road changed from un-lined. To being marked with center stripe and shoulder stripes. potholes and frost heaves as the road conditions improved markedly. There was no loss of beauty however. Sunday around noon we rolled into Mezidian Lake. This is John & Daves site down below by the water. to Stuart BC/Hyder, Ak to see the bears at Fish Creek. the Grizzlies are right behind. The National Forest has installed viewing platforms to watch the Grizzlies feed. Unfortunately the Salmon had not yet arrived so we did not get to see any bears. and all sorts of bears chasing the Salmon in the shallow stream. Below we are near the foot of the glacier. Salmon Glacier is the 3rd largest in North America. above the Glacier affording us magnificent views. Below Ron is perched on a ledge. The photographer becomes the photographed. As the glacier carves its way down to the sea, it creates debris trails in the ice field. The truck is poised for takeoff. Now look closely at this picture. you look closely you can see on in front of Kates eye just as I snapped this photo. Everywhere is a stream flowing down the mountainside. And a snowcave to cool off. in front of us. It then paralleled us as we drove slowly next to him. He did not seem pleased with our presence. The end of our day found us at the Shady Rest RV Park in Houston, BC. It is a very pretty place with tons of flowers all over the park. The lady checking us in was very friendly and efficient. We are about 1/2 way thru BC and expect to be back in the States on Friday the 18th. And... its getting dark once again. Its currently 10:30pm and its almost dark out. It seems so strange. I don't like it. Oh well. Its dark so that means it must be time to go to bed. Time to play a little catch up here. We left Whitehorse enroute to Teslin Yukon. to push on to our next nights stop and spend two nights instead. and our first view of the lake confirmed my expectations. that has been our blessing for so much of this trip. While at Teslin I just had to get this shot of the bridge one more time. Pacific Coast. It is much less traveled and hence a smaller road. Here is is barely wide enough for two vehicles to pass. Along the way we saw more wildlife - including a black bear that was up in a tree. Boya lake has the most beautiful shades of blue and turquoise. The colors are much like the Caribbean. They come from the white sand and shells that cover the bottom of this crystal clear lake. Another lake-view from our site. Of course this is a remote area and there were no services of any kind. of the water gently lapping the shoreline. the call of the Loons. on a high-seas adventure touring the lake and its many islands. Just like in the Caribbean, the water color changes with depth. Looking at our campsite from the water. Ron & Maxine were to the left around the cove just beyond the picture. Maggie loved the canoe and rode in the center. She was quite the paddler. Later that day I snapped this closer picture of Maggie going for a ride. Meanwhile I went for a couple of swims. the Titanic sank but a little cool water never bothered me. I just love to swim and when I see water I have to jump in. I was not the only water dog however. so I gave myself a haircut and a mustache trim. Then once again it was time to move on. Like so many places that we have visited on this trip it was a bittersweet departure. fully digested all that our current locale has to provide. I can only say again that this place is on the list for a return visit. a clear blue sky this place just has to be magical. 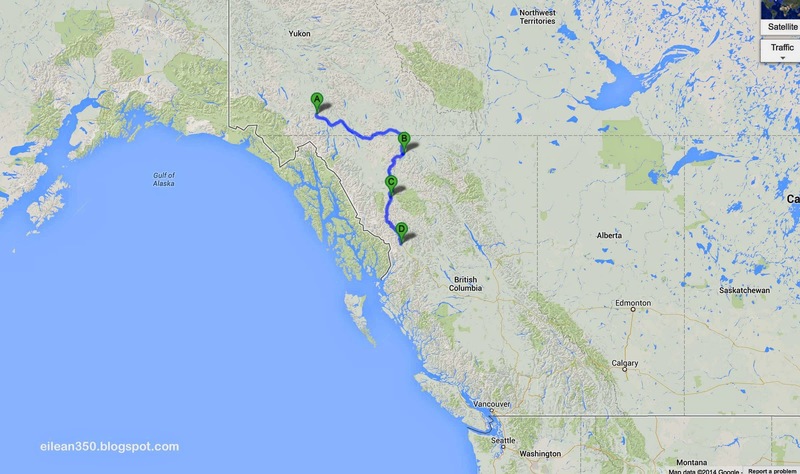 On Saturday morning we headed about 150 miles south to Iskut, BC. It was centrally located on the Cassier Highway for our next anticipated stop on Sunday. Along the way we saw this Moose swimming across a lake. Why did the Moose swim across the lake? Perhaps the grass is greener on the other side of the lake. our stop for the night. The Mountain View RV Park. The park was located down the hill near the lake. Our three rigs side by side for the night. Ron went fishing down by the lake and caught some whopper rainbows. He set them all free. We are now another 150 miles further south at Meziadin Lake Provincial Park. The road has acquired a center line and has gotten wider. Civilization is encroaching upon us. to Fish Creek to watch the Grizzly Bears feeding on the spawning Salmon. Then a side trip to the Salmon Glacier. But that is another days post. When we leave here it is only about 150km or so and we will be back in Civilization. for the length of our stay. It is not super fast but a very fair price. Tour will be ended.... But that too is for another day. Fairbanks, Ak. We make the turn. Denali National Park & Preserve.